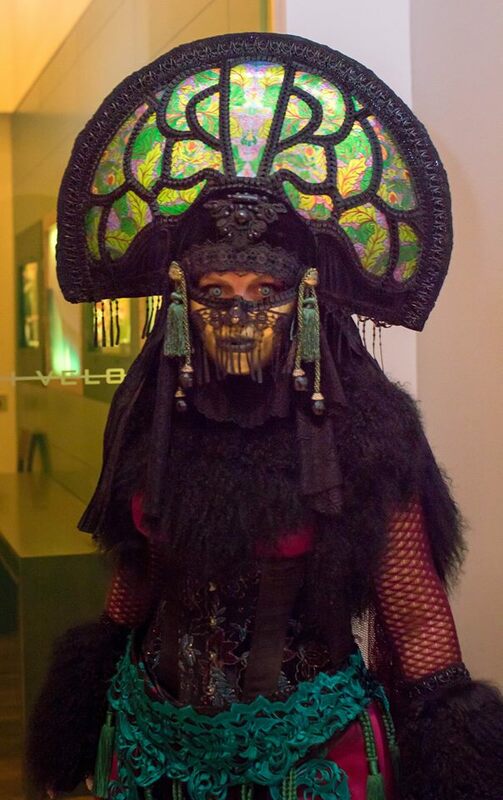 Paige Gardner is an award-winning costumer who regularly appears as a guest presenter on unconventional costuming at science fiction and fantasy conventions in the U.S. and Canada. 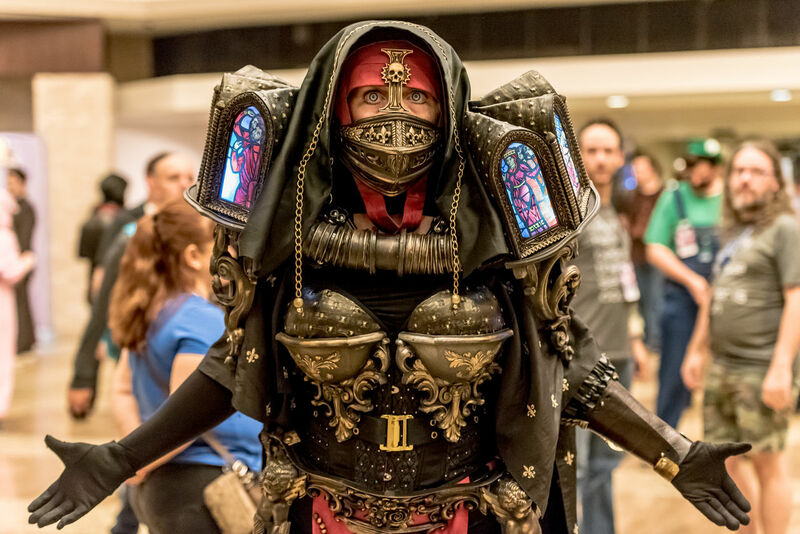 While Paige has created recognizable cosplay from the Sci-Fi universe, she is mostly recognized for her “costume as art” ethic through original projects constructed from found, salvaged or vintage items. As a costumer who doesn’t sew, Paige is a popular panelist who shares her enthusiasm for costuming with the minimum of resources and the maximum of tenacity! Paige’s humorous approach to daunting projects features shocking shortcuts, fresh ideas, and eccentric tips for building costumes using salvaged items, thrift store finds and other unlikely oddments. Paige’s costuming work has appeared in national news outlets, magazines, television and independent film as well as being featured in books, including “1000 Steampunk Creations”, “1000 Cosplay Creations” and “The Steampunk Users Manual” by Jeff VandeMeer. Her ‘costume art’ projects have been exhibited at various venues around the U.S.
DragonCon, Atlanta GA — Comic-Con International, San Diego CA — ChattaCon, Chattanooga TN — Con-Nooga, Chattanooga TN — ImagiCon, Birmingham AL — AnachroCon, Atlanta GA — Hypericon, Nashville TN — PlayOnCon, Birmingham AL — Steampunk World’s Fair NJ — GeekMediaExpo (GMX) Nashville TN — Wizard World Comic-Con, St. Louis MO — Alabama Phoenix Festival Birmingham, AL — Fal-Con, Montevallo AL — Artifice Club Atlanta GA Events (Clockwork Carnival, Weird West Saloon, Atlanta Steamfest), Marble City Comicon Knoxville TN — MomoCon Atlanta, GA — Grand Canadian Steampunk Exposition Canada — Motor City Steamcon Detroit MI — Wild Wild West Con Tucson AZ –Odd Beauty Southampton NY — Atlanta Steampunk Exposition GA — Anime North, Toronto CA. Director “The Steampunk Exhibition”, “The Gadgeteers Showcase”, “Tinkers Clockwork Carnival”, Biscuits & Bowlers at Dawn: High Fashion and High Tea” at DragonCon (Atlanta, GA), Curator for Museum of Alternate History – DragonCon, Director of Fabrication Panels at AnachroCon (Atlanta, GA), Director Steampunk Stroll and related programming at ChattaCon (Chattanooga TN), Director of Steampunk programming at ImagiCon (Birmingham AL), Director of Steampunk programming at Alabama Phoenix Festival (Birmingham AL), Director for Vintage Vogue Fashion Show at DragonCon (Atlanta, GA). Best in Show at ChattaCon 2011, Best in Show Mechanical Masquerade 2010, Best in Show (intermediate) Con-Nooga 2010, Best in Show at PlayOnCon 2010, Best in Show Witches Ball / Birmingham 2010, GOTC (Girls of the Con) 2012 Calendar Feature, Dim Horizons Calendar 2012 Calendar Feature, Costumers Guild 492 Costume Award at San Diego ComicCon International 2013. 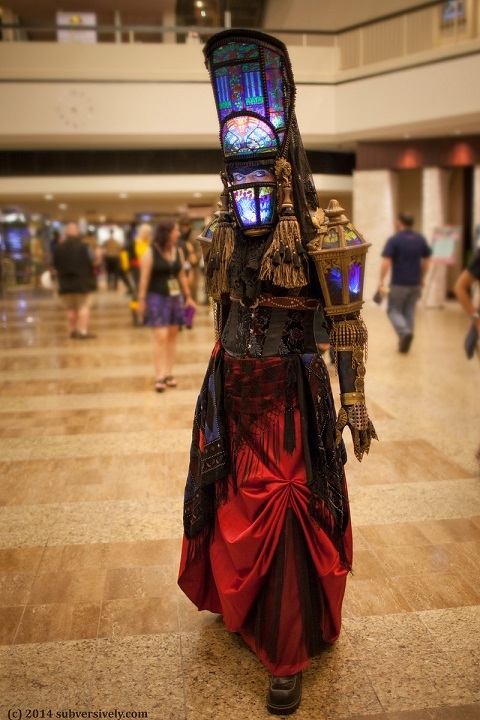 Judges Choice & Audience Choice for Best 3-D Art / JordanCon 2014, Best Use of Lights – Readers’ Choice Award (Steampunk Chronicle 2015). Costume Judge for various events including: AnachroCon, Mechanical Masquerade, PlayOnCon, Alabama Phoenix Festival, Atlanta Steampunk Exposition, ‘The Chosen Cosplay Competition’ at DragonCon, ‘The Masquerade’ Anime North (Toronto). Historic Barrington Hall Plantation, Roswell GA – Worthmore Historic Decatur, Decatur GA – The Steampunk Exhibition, Atlanta GA – The Gadgeteer Showcase, Atlanta GA – SteamFest, Academy Theatre, Decatur GA – Naked Art Gallery, Birmingham AL – The Costume Exhibition at DragonCon Atlanta GA -The Museum of Alternate History, DragonCon, Atlanta GA – “Steampunk: An Exquisite Adventure” (Scottsdale Public Art Exhibition), Scottsdale AZ, YomuCon (Tuscaloosa AL), The Knoxville Exposition (Marble City Comicon), The Hoover Library (July 2015), Odd Beauty: The Techno-Eccentric World of Steampunk, Southampton NY (Oct 2017). My presentation specialty is teaching methods of reconstructing existing garments/salvage materials/found items into Steampunk gear, masks, creative costumes and art with the most basic of tools and resources. Often referred to as “no-sew, low-pro” costuming, my panels are ideal to jump-start costume, prop and art projects for those who are new to the craft. 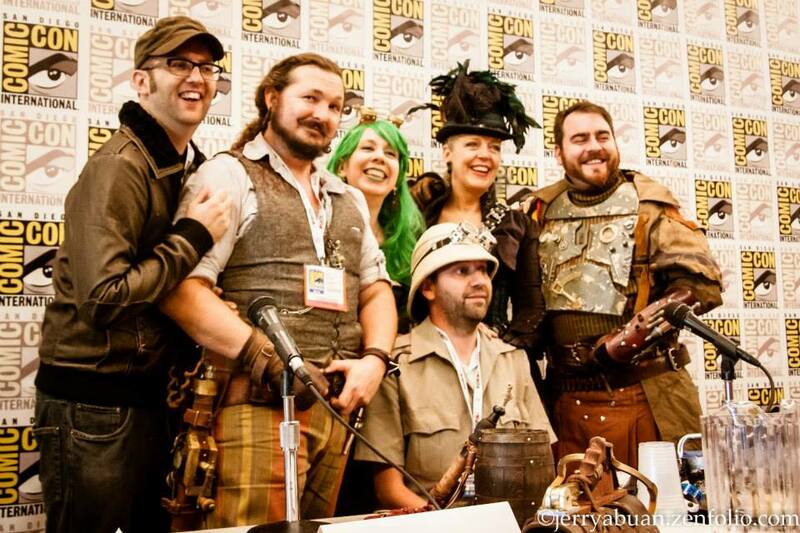 Most of my costume work is typically recognized within the Steampunk community as part of a series of Automatons (each with specific functions). The vintage items incorporated and altered into the automaton’s gear reflect the automaton’s purpose. 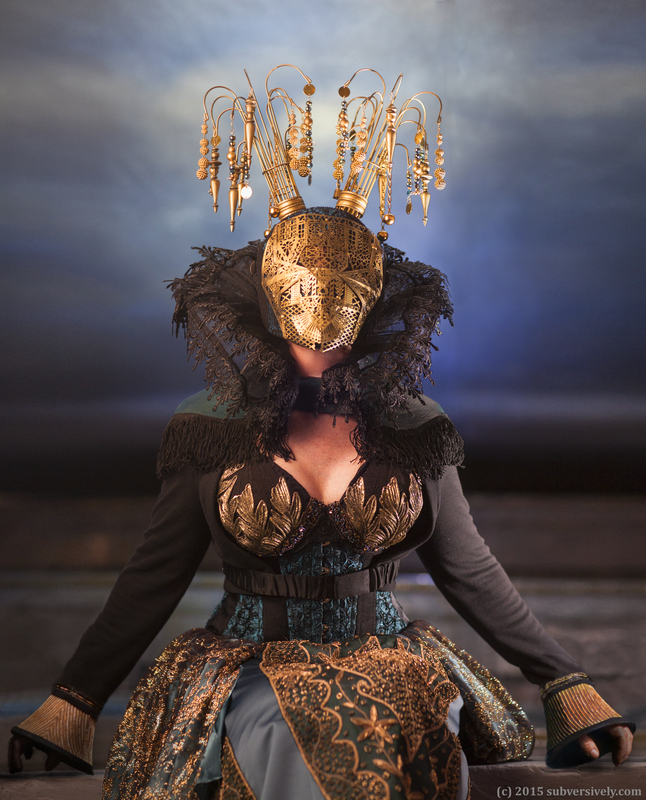 The masks, gear and accessories are completely handcrafted with found/salvaged items and created as individual wearable artwork. My mandate as a guest/presenter is to entertain and engage every audience with memorable and informative panels that encourage attendees to keep moving forward with their costuming/artistic goals. A list of my convention appearances, exhibitions, and related work appears below. The Desperate Steampunk: How to build a boss costume with the minimum of skill and resources. Behind the Mask: Intermediate how-to on building masks for costume or art projects. I love to share my enthusiasm with folks who are interested in alternative costuming, resourceful prop building, and recycling as an art medium. Please reach out to me BELOW if you think I can contribute to your convention or special event. I’m portable – smile! Have you thought about doing a panel at wizard world comic con in New Orleans Jan. 6-8, 2017? I’m not affiliated with them but would like to attend any panels you would have. I’d welcome the opportunity to panel at WW in NOLA – but the process of attending is very different from most events I’m able to present at. 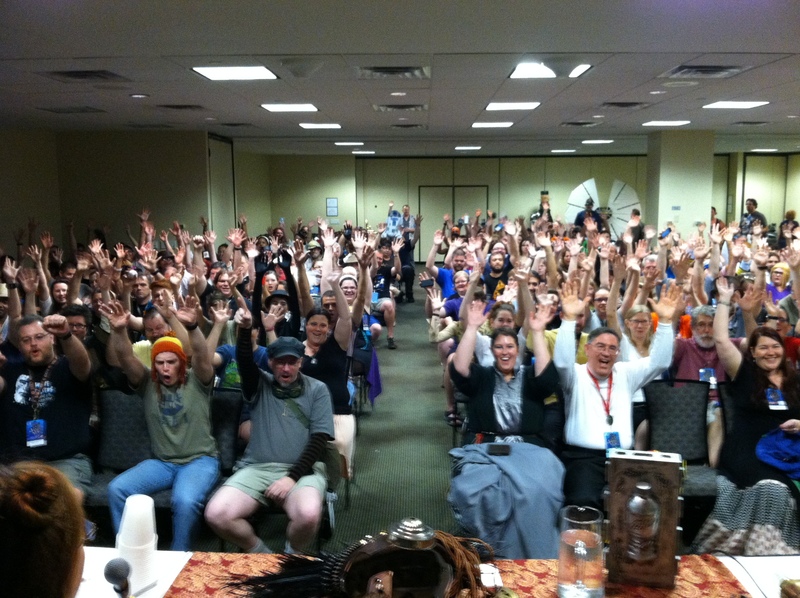 I did a popular panel at WW in St. Louis a couple of years ago – and it was huge fun. I was contacted by a local coordinator for WW panels, then. But I haven’t been queried by Wizard World – New Orleans. (I’d love to attend – just to see all the awesome costumes! you need to come to Florida to see me.